Its wet and cold outside, so there is nothing more delightful than having a little time sewing and being able to kick back and play a little. I am teaching a couple of workshops and one of those explores free motion embroidery but I thought I would also try a hand at appliqué portraits as an option. It is a great way to use up scraps as you only need small amounts of fabric. It can be quite interesting to play around with the fabric direction to enhance the shape. I really liked the way this brown flower piece seemed to create an interesting top detail. Free motion embroidery is addictive! its just a case of dropping the feed dogs, (the metal teeth that move the fabric past the needle), most machines have a little button, most likely your manual will tell you where to find yours. Use a embroidery needle, its not just sharp but also has a strong shank. 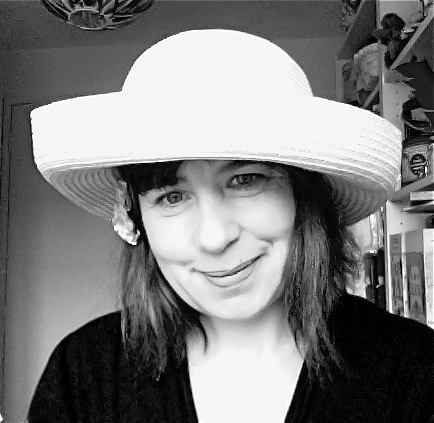 I used this picture as a template – I wear a lot of hats and so it is a recognisable feature. 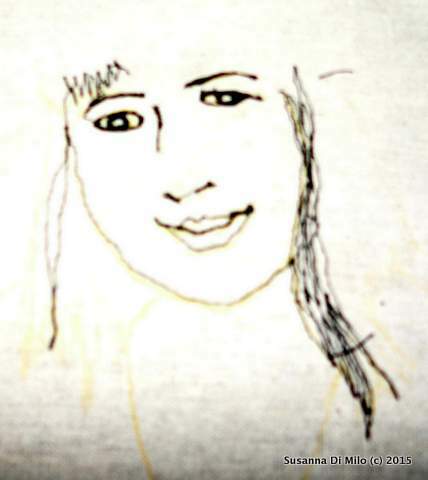 You need to print your picture out roughly the size you want to stitch. While this photo looks a good choice, the tilt of my head creates an angle for my eyes, and my mouth is slightly tilted you can see what problems crop up in the stitched portrait. As it is just playing I decided to go with it. You can get something called dressmakers’ carbon paper, its used to transfer embroidery designs or simply use ordinary carbon. Iron your fabric so that it is free of creases it should be larger than the picture. 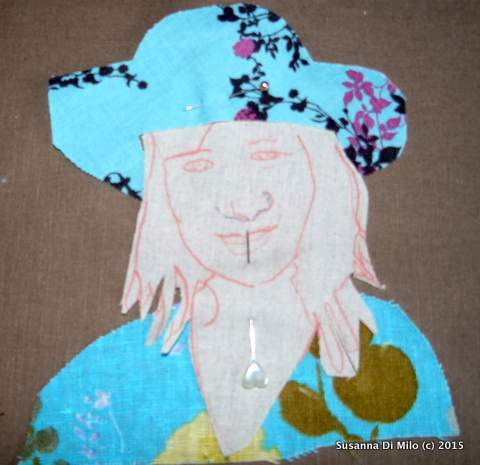 Lay the carbon paper on top – make sure the transfer side is face down onto the fabric – finally place the picture on top. Carefully trace the features, eyes, mouth, hair and nose. It helps if you use a ball point pen that shows up in the photograph so you can see what you have traced. Its important to check you have all the pieces because once you lift the picture off, you cannot re-do it. I find it easier to back the fabric with some iron on interfacing, and a hoop. It prevents the fabric from shifting and wrinkling as you stitch. 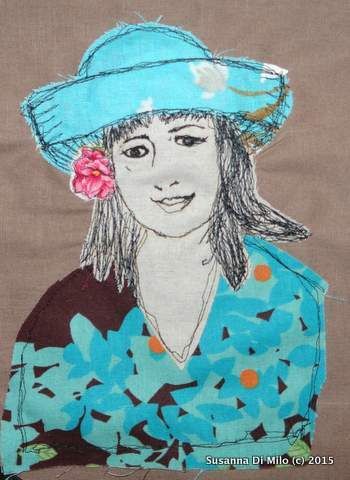 Drawing with your sewing machine is easy but different to using a pencil. The needle stays in place and you move the fabric to create the lines rather than the paper staying still and the pencil moving! Use a darning foot – you can see easier and the loop of the foot prevents the fabric from being pushed through the holes in the footplate. You may find it easier to work backwards and forwards, moving the fabric quickly results in large stitches, or slowly creates tiny stitches. Once you have created the features, you can trim it and then assemble the appliqué shapes. 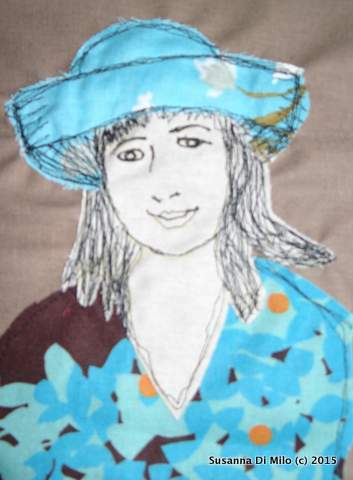 Use the photograph to create the appliqué templates, such as the hat, and the dress. Use the lines not just to highlight the features, but also to give shading to the hat. Finally I added a rose appliqué, another feature I often have is a flower brooch in my hair – this was a tiny flower on a scrap of fabric, but it really brightens up the whole picture. I think it is best to simply follow a few lines, rather than go into too much detail. I could have put in the cheeks and little dimple that you can see in the photograph, but it can go drastically wrong! less is more. As you can see, the tilt has meant my eyes are at a slight angle. I think I can get away with it, but maybe next time I shall try and get a more level photograph. I do hope you will try this, its so much fun – frame them in an embroidery hoop and hang on the wall.